This superb historical and ethnographic study of the political economy of the Vega Baja region of Spain, one of the European Union’s “Regional Economies,” takes up the difficult question of how to understand the growing alienation ordinary working people feel in the face of globalization. 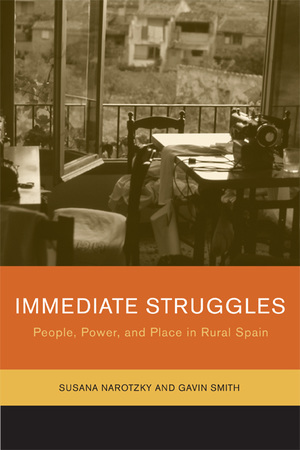 Combining rich oral histories with a sophisticated and nuanced structural understanding of changing political economies, the authors examine the growing divide between government and its citizens in a region that has in the last four decades been transformed from a primarily agricultural economy to a primarily industrial one. Offering a new form of ethnography appropriate for the study of suprastate polities and a globalized economy, Immediate Struggles contributes to our understanding of one region as well as the way we think about changing class relations, modes of production, and cultural practices in a newly emerging Europe. The authors also consider how phenomena such as the “informal economy” and “black market” are not marginal to the normal operation of state and economic institutions but are intertwined with both. Susana Narotzky, Professor in the Department of Anthropology at the University of Barcelona in Spain, is author of New Directions in Economic Anthropology among other books. Gavin Smith, Professor in the Department of Anthropology at the University of Toronto, is author of Confronting the Present: Towards a Politically Engaged Anthropology (1999).